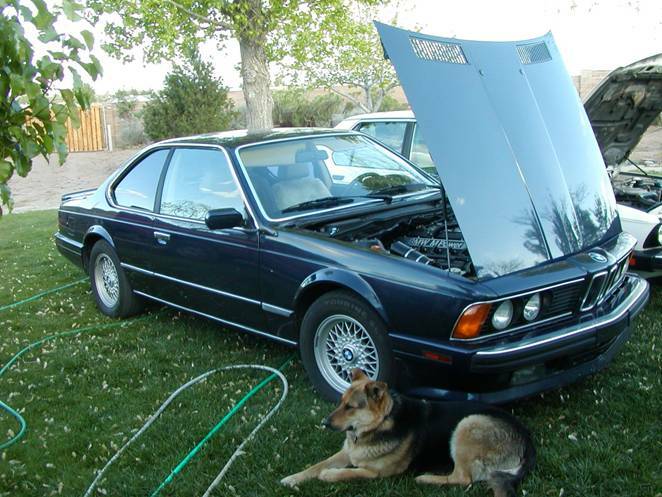 I recently replaced the timing chain and associated parts on my 1988 M6. I?d heard that this is a good thing to do as failure of these parts can turn the engine into scrap in a millisecond. Apparently the replacement process was decided by secret proclamation, as I have never found any details about it beyond ?take it to a good shop and give them boatloads of money?. This advice is typically followed by words to the effect of ?you?d have to be crazy, stupid, or desperate to try it yourself?. In hindsight, I must agree. But would I do it again? You bet. I don?t have a good shop to go to or boatloads of money to give away. I have no idea what the differences are between the various flavors of the S38 engine. My 1988 M6 is the B35 version. It had 134K miles on all original parts. I also decided to replace all the coolant hoses as part of this job since they?d be accessible. I almost pulled the head too, (even bought the bolts, gasket, o-rings, etc.). 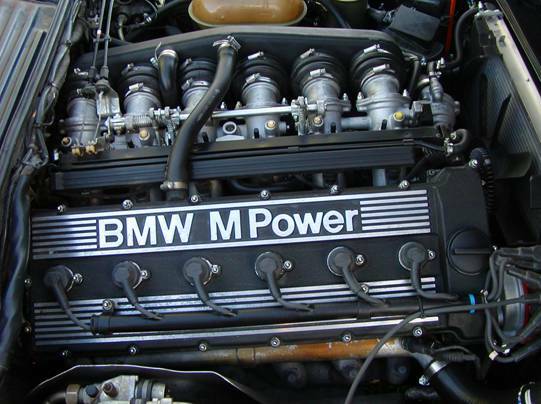 I imagine the secret BMW proclamation directs this, but I found it wasn?t absolutely necessary. There is no room to work on this engine. All the parts around the front of the engine had to come off to provide access to the timing chain area and room to work. This is the easy stuff. The only hard part was keeping track of all the nuts and bolts. I started by removing the hood. Those hoses that feed washer fluid to the frogs, I cut them and used little drip irrigation couplings to put them back together when I put it back on. Then I put the front of the car on jack stands so I could get underneath. 1. Removed the fan. Reverse thread, 1?? open end wrench. Had someone squeeze the belts while I smacked the wrench with a hammer. 2. Removed the radiator and fan shroud. I couldn?t find any coolant drain on the M6. Instead, I yanked hoses and let the stuff run all over and make a big mess. 3. Removed the fan belts. 4. Removed the air box, airflow meter, intake assembly (basically everything upstream from the throttle bodies) Left the throttle bodies in place. 5. Disconnected the battery and removed the alternator. 6. Unbolted the power steering pump from the bracket that holds it (and the alternator) to the block, then removed the bracket. Used a bungee cord to hold the pump up and out of the way. 7. Removed the distributor cap and ignition wires. Covered the open tubes that go to the spark plugs with a sheet of tinfoil so stuff wouldn?t get in there. 8. Removed the distributor rotor and the round casting behind it (3 bolts). 9. Removed the crank sensor and bracket that?s bolted to the timing cover, passenger side. 10. Removed the pulley on the end of the water pump and then the pump. 11. Removed the pulley from the end of the crankshaft and the harmonic balancer. I could now see the whole timing chain cover and everything from the cam cover to the oil pan was open and reasonably accessible. It was also filthy. Started with a little plastic scraper to remove heavy gunk. Followed up with brake cleaner and a small scrub brush. Still dirty. More brake cleaner, rags, and an old toothbrush worked for removing every trace of dirt from the front of the engine. The oil pan had to be removed to make room for taking off the timing chain cover. (The timing chain cover is clamped between the oil pan and the head.) First I removed the upper nuts on the engine mounts (17mm socket). Then I used a floor jack placed under the front of the oil pan with a board on top of it (to prevent damaging the oil pan) to gently lift up the engine about 2?. Then I place small wood blocks on top of the engine mounts to hold the engine up after the floor jack was removed. Next I drained the oil and began removing all the bolts around the oil pan. When I got to the rear I found the back of the oil pan was covered by a big cast plate that is part of the bell housing. 4 of the bolts holding this plate on have a weird metric torx head. I found a socket (E10 is the marking on it) that fit in a set at the auto parts store for $17. Once this plate is removed it can be wiggled out of the way to gain access to the back of the oil pan. Once the oil pan was free I had to unbolt the oil pump to remove the pan. Three M8 (13mm head) bolts and 2 M6 bolts (10mm head) hold the pump to the engine. The pump is chain driven and the chain sprocket must be removed also. The M10 (17mm) nut comes off and the spline shaft then slides out of the sprocket. I dropped the pump into the oil pan and slid the whole mess down and out the front to remove it. There is a really big (36mm) collar nut on the end of the crankshaft that has to come off before the timing chain cover can be removed. It was originally installed at 325 ft./lbs. Because it?s a collar nut with a big flat flange (more surface area compressed against the crank hub than a normal nut) and it had been on there for 16 years, it would take a lot more than 325 ft./lbs. to break it free. If I ever do this job again, I will buy a harmonic balancer from a junkyard and have a piece of pipe long enough to reach under the frame welded to it. I would bolt this to the crank hub and use it to lock the engine. Then I would buy a six-point 36mm ?? drive impact socket and a ?? drive breaker bar. A set up like this with a 4-5 foot cheater pipe and 2-3 guys pulling really hard would probably break this nut free. 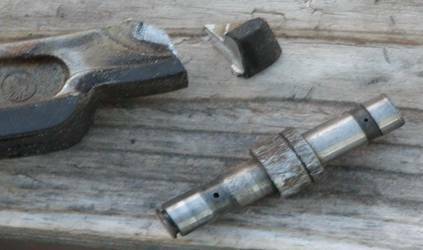 I say probably because I talked to one guy who did just this to remove his hub nut years ago and ended up breaking off the threaded stub on the end of the crankshaft instead. What I did was buy a 6-point ?? drive impact socket and a high quality ?? drive breaker bar and attempted to use this to remove the nut. I used a 5-foot cheater bar and had someone put the car in 3rd gear and press hard on the brakes while me and a friend pulled as hard as we could on the cheater bar. No joy, it wouldn?t budge. My friend thought the breaker bar was too short and got his longer one. The longer bar would reach the frame so we braced it there and then cranked the starter. Still wouldn?t break free. Next we tried heating the nut with a torch and tried the starter trick again. No good. Lastly my friend put the long cheater bar on his long breaker bar and we pulled as hard as we could with someone on the brakes. SNAP! The breaker bar broke and the nut hadn?t budged. I removed the cam cover and put the harmonic balancer back on the hub. I didn?t put it on tight; just enough to hold it in place, making sure the keying pin was in place. The goal was to clock the engine so that #1 cylinder was at TDC. I scrounged up a couple long bolts and threaded these into the hub so I could use a pry bar between the bolts to turn over the engine. As much of a pain as the hub nut was, I kind of missed it, it sure was handy for turning over the engine. Once the OT mark on the balancer lined up with the raised mark in the center of the timing chain cover I checked the cams for an indexing mark. Turns out there?s more than one indexing mark on the camshafts. I was 180 out so I turned the engine over again until the OT mark was lined up and lo and behold, there were the indexing marks on both camshafts. The marks are subtle but unmistakable once you find them. They are located just behind the front journal on each camshaft, the marks are small square grooves, almost like a keyway groove, cut into the camshaft that lines up perfectly with an identical size grove cut into each journal. Next I removed the harmonic balancer and the hub, the hub just slides off. I removed all the remaining bolts holding the timing chain cover and removed the cover. It took a little careful prying but it came off. I removed the cover on the front of the cam tower over the intake cam to get access to the intake cam sprocket (the exhaust cam sprocket was exposed when all the distributor stuff was removed). The chain tensioner was next; I took it all off and everything, including the piston, popped out. Then I removed the upper chain guide between the cams by removing the two bolts holding it on. The next step was to remove the cam sprockets. Each was held on by 6 M6 (10mm head) bolts. The bolts are locked in place by a big folding washer that has a tab folded up on to the side of each bolt. I used a small chisel and a flat punch to bend the tabs away from the bolts and then removed the bolts. I gently tapped the sprockets to get them off the camshafts and by dropping down the intake sprocket first and then the exhaust sprocket there was enough slack in the chain to allow me to lift and remove the sprockets from the top. The chain was almost free; the plastic guide rail on the driver side was all that was holding it in place. I removed the two clip rings holding the guide on the studs. Still not quite enough, so I unscrewed the studs and I was able to drop everything out the bottom. On the front of the head there were two round shafts with a threaded hole in the center of them. 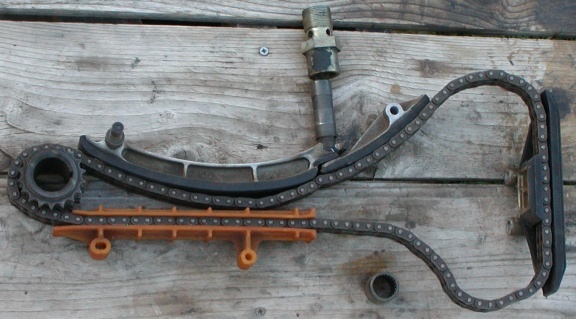 The one on the driver side holds the idler sprocket, the one on the passenger side hold the upper chain tensioner. I removed these by putting a socket that?s bigger than the shaft over the shaft and threading a bolt into threaded hole. As I tightened the bolt against the socket it pulled the shaft out. There?s a small socket head bolt that comes down from the head in front of the shaft on the passenger side that I had to remove before doing this. There?s an o-ring on each of these shafts and once it?s clear of the head the shafts come out easy. I also wanted to replace the lower timing chain sprocket. The teeth seemed too pointy with almost no flats on the tops. I had to buy a small 4? gear puller to do this. Found one for $7 at a cheapo tool store. Figured if it broke I could always go back and buy the fancy $35 model. The trick here is the puller has to be short enough to fit on the sprocket without hitting the AC condenser. I greased the threads on the puller shaft and the end of the puller where it contacts the end of the crank, got the fingers behind the 2nd set of teeth on the sprocket and started cranking away. I was sure the puller was going to break because I was really cranking on it and nothing was happening. Suddenly there was a snap like something broke, but no, the sprocket was coming off. Kept cranking on the puller and the sprocket came right off. All the timing chain components were now out except for the main tensioner rail. The top of the rail sticks up into the chain channel on the head. All that holds it in the engine is a shaft that comes out of the block with clip ring on the end. Removing the clip ring allowed the rail to slide out but it runs into the edge of the head well before it comes off the shaft. If only it was about a ?? shorter there would be no problem. This was the point where I almost removed the head. Someone on-line told me that the pin the rail was riding on was a stud, all I had to do was grab it with vice grips and unscrew it. This may be true on the B36 or B38 versions of the engine but not the B35. I tried it and soon discovered that on the B35 this is a press-fit pin and my chances of removing it with vice grips with rail in place were nil. I went to the dealer and ordered a head gasket, head bolts, new rail pin, etc. and resigned myself to pulling the head to get the stupid rail off. This was bugging me. 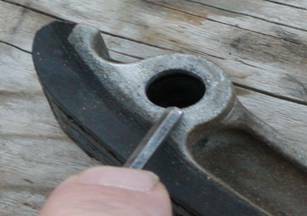 Once the parts arrived I began removing the exhaust manifold (very tedious job) and started thinking, ?I?ve got a new rail, I?ve got a new pin, why not cut off the end of the old rail with a hacksaw and get it out of the way? Maybe that?s the trick to this job.? Sure enough, it worked. I cut off the top of the rail, being careful not to damage the head gasket and it came right off. With the rail out of the way it was easy to get a grip on the pin with the vice grips and using a pry bar between the vice grip and the block I was able to wiggle the pin all the way out. I bolted the exhaust manifold back on and got ready to put it all back together. I started by installing the lower timing chain sprocket. I put the new sprocket in the toaster over set at 400F and left it there for 30 minutes. I made sure I wasn?t putting it on backwards (single row of oil pump sprocket teeth to the rear) lined up the keyway with the key still on the crank and quickly slid it all the way on the crankshaft. I checked it 5 min. later and it had cooled enough to lock firmly onto the crankshaft. I placed the oil pump chain on the sprocket. Next came the main tensioner rail. I put the 2 little o-rings inside the rail (there are two grooves inside the rail for the o-rings) put the new pin in the rail and installed the clip ring. It was a little crooked when I held the rail & pin in place but close enough that with a couple of light taps with a small hammer the pin began to go into the block. As soon as that happened everything straightened up and went right together. I had to hit the pin pretty hard to get it all the way in so I held a hacksaw blade across the top of the pin and hit that to keep from messing up the top of the pin. I installed the idler sprocket with the tall side of the sprocket to the front. Again, the o-ring was in good shape so I reused it. I put a little assembly lube (moly grease) in the needle bearing just before assembly. On the front of the shaft there?s a little curved cutout, make sure this lines up with the curved cutout on the front of the head. Next the two studs that hold the plastic guide, the plastic guide, and the chain went in. I made sure there was a flat washer under each one of the studs (sets the height) and I applied Loctite Blue to the threads. The guide is installed behind the chain, with the opening to the front and the end with the angled opening down. I had to install the chain and guide at the same time since I couldn?t find a way to put on the chain with the guide installed first. It?s a tight fit and I had to twist the guide a little bit to get the studs in and started. As soon as that happens everything got easy. I torqued the studs to 16 ft./lbs. I don?t know if the Loctite is necessary but it looks like if those studs come loose the engine would self-destruct with little or no warning. Getting the cam sprockets in was interesting. First I put the timing cover and harmonic balancer back on to make sure the crank was still aligned exactly on the OT mark. It was so I took the cover and balancer back off. Next I checked the cam alignment and found the intake cam had moved slightly. I threaded a couple bolts into the end and used a pry bar to get the indexing marks lined up exactly. I installed the new tensioner piston, old spring and new tensioner cylinder. I didn?t torque the tensioner cylinder, just snugged it up. At this point I wanted to check to make sure everything was aligned properly. I installed the timing cover (no bolts, just used the alignment pins on the cover to hold it in place, the hub and the harmonic balancer. Again I used a couple long bolts threaded into the hub and a pry bar to carefully and slowly turn over the engine 2 complete revolutions. I stopped with the crank exactly on the OT mark and checked the indexing marks on the camshafts. The indexing marks were lined up exactly on both camshafts so I knew I had it assembled right. I removed the balancer, hub and timing cover to re-inspect the chain installation. Double checked the idler sprocket to make sure it was under both rows of the chain, made sure the tensioner rails were in right, all clips fully in place. Noticed I?d left the upper guide (between the cam sprockets) off so I installed the new one and torqued the bolts to 16 ft./lbs. I torqued the tensioner cylinder to 68 ft./lbs. and installed the rest of the tensioner assembly. I recleaned the mating surfaces of the timing chain cover and coated the new cover gaskets with a thin layer of hi-temp silicone gasket sealer. Thin is the key, I don?t like a lot of squeeze out especially on the inside of the engine where it can come loose and clog up the intake to the oil pump. The gaskets are longer than the cover, I put them on the cover and carefully trimmed the top edge flush with a razor blade. Next I used a toothpick to apply a small line of Hondabond (A non-hardening gasket sealer used by motorcycle shops to seal the crankcases of two-stroke engines. Thanks to Jim Johnson @ Sandia BMW for this tip.) where the head gasket first comes out of the block. This is where the upper corners of the timing cover meet the block & head. I used a small dead-blow hammer to tap the cover in place on its locating pins and installed a couple screws on both sides of the cover just to snug the cover down. Then I installed the 3 socket head cap screws that attach the timing cover to the head. The idea was to pull the cover up and in to get the best seal. Once I had everything snugged up I torqued the 3 screws at the top to 7.5 ft./lbs. and worked my way down, torquing the M6 (10mm head) bolts to 7.5 ft./lbs. and the M8 (13mm head) bolts to 16 ft./lbs. Now it was time to put the oil pump & pan back on. First I trimmed the timing cover gaskets flush with bottom of the block. Then I coated the pan gasket with a thin layer of silicone to hold it in place and with the oil pump in the pan slid everything up into place. Assembly was the reverse of installation. I put the pump sprocket in the chain and fit the spline shaft of the pump into the sprocket. I torqued the 3 M8 bolts to 17 ft./lbs. and the 2 M6 bolts to 8 ft./lbs. 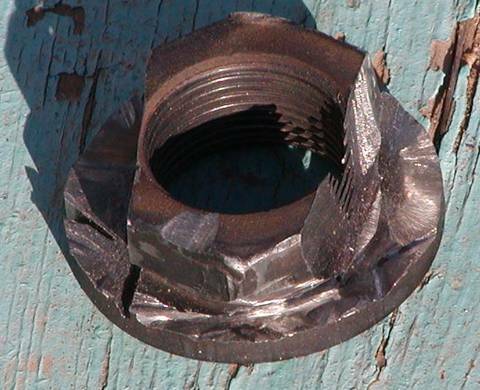 I torqued the nut that holds the sprocket to the shaft to 35 ft./lbs. I put a line of Hondabond across the point where the timing cover gasket meets the pan and I torqued all the M6 bolts that hold the pan on to 8 ft./lbs. When I installed the cast cover to the bell housing I torqued the torx bolts to 34 ft./lbs. I went back up to the cam tower to finish installing the cam sprockets. I installed and torqued the M6 bolts to 8 ft./lbs. and bent the folding washers up around each bolt on both sprockets. I installed the cover over the intake sprocket (8 ft./lbs.). The last big thing to do was install the new hub nut. Install the hub, put on the flat washer and then the hub nut. I didn?t have a torque wrench that would go up to 325 ft./lbs. so I improvised. I used an in-line scale for measuring loads on cranes. Any type of pull scale that would accurately read to 81 lbs. would do. I then put my cheater pipe on my breaker bar and measured exactly four feet from the head of the breaker bar to a spot on the cheater pipe. I marked this spot with a circle of tape. The idea was that 81 lbs. applied on a 4 foot lever will produce 324 ft./lbs. of torque and that should be good enough. It took 4 people to do it but it worked. With the hook of the scale at the 4-foot mark on the pipe I pulled real hard. One person was on the brakes, one person watched the scale, one person with their hands near but not on the cheater bar (if something gave way I didn?t want the bar to put a big dent in my fender) and me pulling on a bar through the hook on the bottom of the scale. It took a couple tries and the socket had to be repositioned but the scale finally reached 81 lbs. The breaker bar flexed several inches but didn?t break. I put new gaskets under the cam cover and tightened all the nuts to 8 ft./lbs. I lowered the engine back onto the engine mounts and torqued the nuts to 35 ft./lbs. From here on out it was a matter of replacing all the stuff I had pulled off to make room around the front of the engine. For torquing I tightened all M6 hardware to 8 ft./lbs., all M8 hardware to 17 ft./lbs. I replaced all the coolant hoses and put in new oil & filter. I?m sure there?s a torque spec. for the fan nut but all I did was have someone squeeze the fan belt while I smacked the wrench with a hammer to tighten the fan. The last thing I did was add antifreeze (1 gal.) and distilled water (about 1.5 gal.). Scary. Very scary, for me anyway. When the engine started I could hear the chain. The spring in the tensioner isn?t really adequate to tension the chain, oil pressure does this. I was too much of a wuss to rev the engine to build some oil pressure so I just let it idle. After 10 minutes the chain noise was almost gone. After about 5 more minutes with quite a bit of that time at 2-3K RPM the chain noise was gone and all was right with the world. 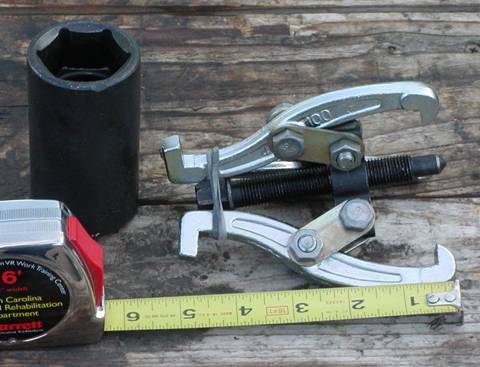 I have heard there is a way to prefill the tensioner with oil but I don?t know how to do that. That would probably make the noise go away much faster. No problems, no leaks, no funny noises. Been up to 6500 rpm with no problem. Last edited by bcadmin on Fri Mar 23, 2007 9:55 pm, edited 2 times in total. 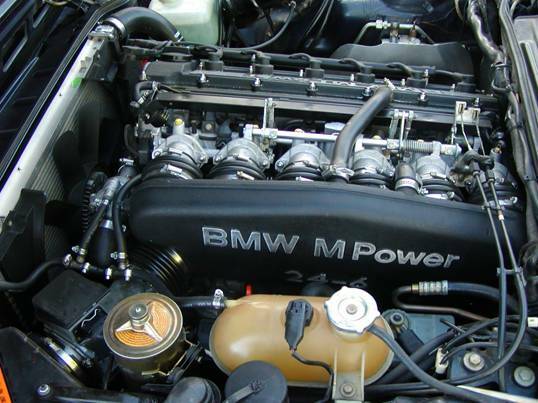 What about replacing the valve springs with out taking off the head ? can well come up with some tricks for that? 1981 635 German FRANKEN6ER gray market RIG, 1988 635,91 Nissan 240SX , 1993 Harley 1340ccFXR Super Glide, 2000 M2 Buell 1200cc. BUELLRIDER wrote: What about replacing the valve springs with out taking off the head ? can well come up with some tricks for that? Thanks Chris, Can I get the cam out with out removing the head? and I might just get a duel cam head from the junk yard . We have plenty here in Md ,I just need to know if the late mod heads will work on mine like 90s ect?